In this example we are going to setup Elasticsearch Logstash Kibana (ELK stack) and Filebeat on Ubuntu 14.04 server without using SSL. 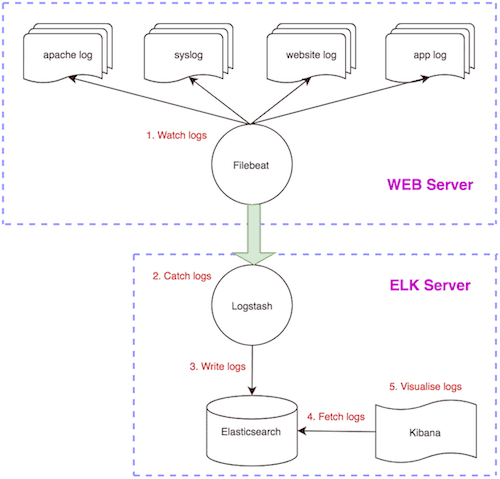 For the testing purposes, we will configure Filebeat to watch regular Apache access logs on WEB server and forward them to Logstash on ELK server. You can add more configurations to watch other logs such as your website logs, syslog etc. This is how the system works. Our ELK stack setup has three components as shown below. Additionally we have one server component as shown below. Our server's IP is 192.168.50.40. Our WEB server setup has one component as shown below. Additionally we have two server components as shown below. Our server's IP is 192.168.50.50. If the client server goes down, Filebeat is capable of remembering the location of where it left off when everything is back online. It can be configured to send logs to either Elasticsearch or Logstash. Check current indexes. Currently there is no index yet. Verify listening IP and port. Check current indexes. As you can see below, default "kibana" index has been created. You should be able to access GUI via http://192.168.50.40:5601 from your browser. However, there won't be any index pattern available at this stage yet. Download Filebeat index patterns so that we can use them in Kibana GUI. Load Filebeat index patterns into Elasticsearch. Process below will load "packetbeat-*", "topbeat-*", "filebeat-*" and "winlogbeat-*" index patterns to Kibana GUI. You can see them on the left hand side of the menu. Load Filebeat index template so that it will configure Elasticsearch to analyse incoming Filebeat fields. Configuration below will print logs to terminal instead of elasticsearch for testing purposes. The grok regex COMBINEDAPACHELOG for Apache logs looks like below. You can see in grok-patterns page. As you can see above, it creates fields below in elasticsearch index so you can use them in Kibana to create graphics. Validating configuration file takes about 10 seconds to get confirmation. Open TCP 5044 port by appending the rule to the end of INPUT chain of iptables. This will allow TCP access to port 5044 from outside. As you can see, the TCP port 5044 has been opened but this is temporary so we will make this permanent later on. Install iptables-persistent to make new iptables rule permanent. Check current indexes. As you can see below, there is nothing apart from default "kibana" index. As you can see below, our ELK server is ready for accepting incoming traffic from our WEB server on port 5044. Configuring to forward logs to Logstash on ELK server. As soon as we start Filebeat, relevant Elasticsearch index "web-apache-access" in ELK server should be created. As you can see below, Filebeat related "web-apache-access" index has been created. Go to http://192.168.50.40:5601 to access Kibana GUI. Type "web-apache-access" in "Index name or pattern" field. Wait for "Create" button to appear and hit it. "agent": "\"Mozilla/5.0 (Macintosh; Intel Mac OS X 10.10; rv:53.0) Gecko/20100101 Firefox/53.0\""